Liberal Bohemian: No talk of impeachment here folks. 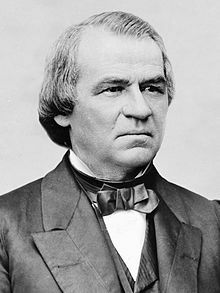 On this day in 1858, for the first time in U.S. history, the impeachment trial of an American president, Andrew (Tennessee) Johnson, begins in the Senate. As with today, the majority of the politicians were self-serving henchmen led by greed and revenge. Abraham Lincoln had just been assassinated and Andrew Johnson had been appointed to the office of presidency. The Civil War was over. The South had lost. Johnson, following in Lincoln's footsteps, wanted to pardon the Southerners, forgive, forget, and move on. The majority of the Senate and Congress wanted the South to pay. That was the basis of the impeachment process, which, Andrew escaped by a single vote. One hundred years later, another Johnson would become president after Kennedy was assassinated for similar reason as Lincoln: trying to do the peoples will in a country who doesn't believe the majority's will should be respected, only the elite Senator and Congressmen and woman, who know what is best for the country. In 1858, the power elite felt that the South needed to pay their debt or their would be chaos and another war, in 1963, the power elite felt that Kennedy's willingness to work with Russia and his hesitation to escalate the Vietnam war, was a threat to the USA. In both cases, the power elite were wrong, much as they are today with their Tax Cuts and War Spending. Only, there are no heroes left to assassinate, their power is too strong and we are too weak. On a brighter note, today's power elite, the Republican Congress and Senate have come to the conclusion that Donald Trump didn't benefit from the Russian interference with the last presidential election. Boy, I feel better already! Also on this day, oddly enough, in 1964, less than a four months after he murdered Lee Harvey Oswald for the assassination of President Kennedy -- yeah, right -- Jack Rudy is found guilty of murder and sentenced to the electric chair. Can you say: swept under the rug, boys and girls? And in today's Orwellian Watch: More Wars and Rumors of Wars.